Read my article with Keane Bhatt on Truthout or here on garalperovitz.com. And find out how to host a community screening of my new film, The Next American Revolution or organize a reading group around What Then Must We Do? here. The richest 400 Americans now own more wealth than the bottom 180 million taken together. The political system is in deadlock. Social and economic pain continue to grow. Environmental devastation and global warming present growing challenges. Is there any path toward a more democratic, equal and ecologically sustainable society? What can one person do? In fact, there is a great deal one person working with others can do. Experiments across the country already focus on concrete actions that point toward a larger vision of long-term systemic change – especially the development of alternative economic institutions. Practical problem-solving activities on Main Streets across the country have begun to lay down the elements and principles of what might one day become the direction of a new system – one centered around building egalitarian wealth, nurturing democracy and community life, avoiding climate catastrophe and fostering liberty through greater economic security and free time. Margaret Mead famously observed: “Never doubt that a small group of thoughtful, committed citizens can change the world; indeed, it’s the only thing that ever has.” Some of the ten steps described below may be too big for one person to take on in isolation, but many are exactly the right size for a small and thoughtful group committed to building a new economy, restoring democracy and displacing corporate power. Leading polling organizations have found converging results among younger Americans. Two recent Rasmussen surveys, for instance, discovered that Americans younger than 30 are almost equally divided as to whether capitalism or socialism is preferable. Another Pew survey found those aged 18 to 29 have a more favorable reaction to the term “socialism” by a margin of 49 to 43 percent. Note carefully: These are the people who will inevitably be creating the next American politics and the next American system. As economic failure continues to create massive social and economic pain and a stalemated Washington dickers, search for some alternative to the current “system” is likely to continue to grow. It is clearly time to get serious about a different vision for the future. Critically, we need to be far more sophisticated about what a meaningful “systemic design” that might undergird a new direction (whether called “socialism” or whatever) would entail. Laura Flanders talks to Gar Alperovitz about What Then Must We Do? Welcome to the spring of sequester and discontent. Just ahead, whatever happens in the world of politics, a world of people are going to experience yet more cuts to education, housing, healthcare, and there’s no solution to poverty in sight. Even for those who were flushed with excitement last November, the new term is already feeling like a pretty glum place. What real change is likely to come? Probably not much. By how much are real wages going to grow? Probably less. “If you counted poverty the way every other nation in the world counts it, a quarter of our society is in poverty,” says political economist Gar Alperovitz. So why is it then, that Alperovitz also says we may be witnessing the prehistory of the next American Revolution? What’s up? Alperovitz believes that the storm of failure we’re witnessing creates crisis but also possibility. When states and cities have “no answers,” new ideas and new experiences have a chance to insert themselves into the mix. Indeed, look a little deeper than the money media tend to, and the US economy is pretty heterodox. Far from one “economy” we live in a “checkerboard” of systems, some of which look a whole lot like socialism. What’s “hotel socialism”? Find out in this conversation about Alperovitz’s latest book What Then Must We Do: Straight Talk About the Next American Revolution, which comes out later this month from Chelsea Green. Alperovitz teaches at the University of Maryland. We talked for GRITtv. Laura Flanders: Am I describing this moment correctly? Post-election enthusiasm followed by gathering gloom? Gar Alperovitz: I think that’s about right and rightly so. The president is committed to $1.5 trillion in cuts for the next decade and at the same time he is talking about boosting the economy. I suspect we’ll get very little change in the unemployment rate [that is] the real unemployment rate, which is probably 15% if you count the people who just don’t show up anymore. President Obama is Time magazine’s “Person of the Year” – the first Democratic president to receive two consecutive popular-vote majorities since Franklin Delano Roosevelt. Yet these are clearly tough times for progressives. Everything progressives have fought for is seemingly on the chopping block nationally, and in many states and cities. Programs are being cut; public assets are being sold off; school teachers are losing their jobs; unions are being attacked; pension and health care benefits are being slashed – even Social Security is being challenged. Progressives, in short, remain on the defensive. No one would deny that defense is important. But even as every effort must be made to hold the line, how, specifically, might it be possible to regain the political initiative? History suggests one powerful strategy – one that begins by getting clear about the checkerboard of power, and its possibilities. Social pain, anger at ecological degradation and the inability of traditional politics to address deep economic failings has fueled an extraordinary amount of practical on-the-ground institutional experimentation and innovation by activists, economists and socially minded business leaders in communities around the country. A vast democratized “new economy” is slowly emerging throughout the United States. The general public, however, knows almost nothing about it because the American press simply does not cover the developing institutions and strategies. 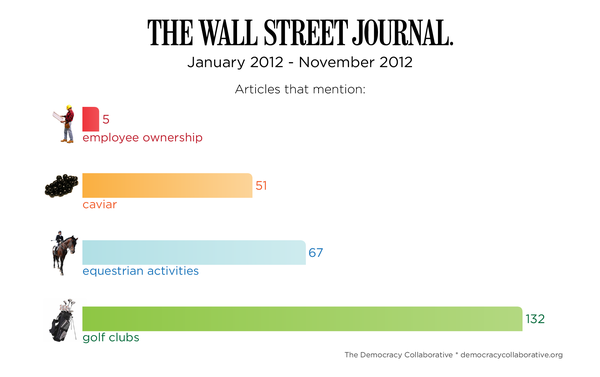 For instance, a sample assessment of coverage between January and November of 2012 by the most widely circulated newspaper in the United States , the Wall Street Journal, found ten times more references to caviar than to employee-owned firms, a growing sector of the economy that involves more than $800 billion in assets and 10 million employee-owners — around three million more individuals than are members of unions in the private sector. Worker ownership — the most common form of which involves ESOPs, or Employee Stock Ownership Plans — was mentioned in a mere five articles. By contrast, over 60 articles referred to equestrian activities like horse racing, and golf clubs appeared in 132 pieces over the same period. Americans face a unique challenge in solving the climate crisis. Unlike other Western countries and Japan, where population is projected to be relatively constant, the U.S. population is set to grow by at least 100 million—and likely 150 million—people by 2050. Where and under what conditions these people live present serious challenges to sustainability planning. American cities today are so spatially and economically unstable that anything beyond superficial sustainability planning is impossible. Alternatively, we can radically change existing community and regional planning strategies to more sustainably house and serve the growing population. Fortunately, emerging approaches are capable of helping with this shift. One involves building local economies that anchor capital in place through community, worker, or public forms of ownership—so-called green community wealth strategies. By linking such stabilizing forms of economic organization to democratic forms of local, regional, and national planning, cities can regain the capacity to target jobs and investment to specific locations. A good starting point is a clear understanding of America’s “throwaway city” habit. Simply put, as jobs move in and out of cities in uncontrolled ways we literally throw away housing, roads, schools, hospitals, and public facilities—only to have to build the same facilities elsewhere at great financial, energy, and carbon costs. All the while, the instability makes it impossible to carry out coherent transportation and high-density housing planning. This article originally appeared in the June 11th, 2012 edition of The Nation. It’s time to put the taboo subject of public ownership back on the progressive agenda. It is the only way to solve some of the most serious problems facing the nation. We contend that it is possible not only to talk about this once forbidden subject but to begin to build a serious politics that can do what needs to be done in key sectors. Proposals for public ownership will of course be attacked as “socialism,” but conservatives call any progressive program—to say nothing of the modest economic policies of the Obama administration—“socialist.” However, many Americans are increasingly skeptical about the claims made for the corporate-dominated “free” enterprise system by its propagandists. A recent Pew Research Center poll found that a majority of Americans have an unfavorable view of corporations—a significant shift from only twelve years ago, when nearly three-quarters held a favorable view. At the same time, two recent Rasmussen surveys found Americans under 30—the people who will build the next politics—almost equally divided as to whether capitalism or socialism is preferable. Another Pew survey found that 18- to 29-year-olds have a favorable reaction to the term “socialism” by a margin of 49 to 43 percent. Public ownership in certain sectors of the economy is the only way to solve some of America’s most pressing problems. Take the financial arena, where the current recession was hatched. Today, five giant banks control more than one-third of all deposits. Wall Street claims this makes it more efficient; but even if the Big Five banks were efficient (which is open to question—how “efficient” are institutions that didn’t know they were carrying a huge backlog of underwater loans? ), they were all deeply involved in creating the meltdown that cost taxpayers billions in bailouts, and the overall economy trillions. Numerous economists, left and right, believe that these unbridled operations will inevitably lead to another crisis. JPMorgan Chase’s recent speculative loss of at least $2 billion should be fair warning. This article originally appeared in the Fall 2011 Issue of Dissent. For over a century, liberals and radicals have seen the possibility of change in capitalist systems from one of two perspectives: the reform tradition assumes that corporate institutions remain central to the system but believes that regulatory policies can contain, modify, and control corporations and their political allies. The revolutionary tradition assumes that change can come about only if corporate institutions are eliminated or transcended during an acute crisis, usually but not always by violence. But what happens if a system neither reforms nor collapses in crisis? Quietly, a different kind of progressive change is emerging, one that involves a transformation in institutional structures and power, a process one could call “evolutionary reconstruction.” At the height of the financial crisis in early 2009, some kind of nationalization of the banks seemed possible. “The public hates bankers right now,” the Brookings Institution’s Douglas Elliot observed. “Truthfully, you would find considerable support for hanging a number of bankers…” It was a moment, Barack Obama told banking CEOs, when his administration was “the only thing between you and the pitchforks.” But the president opted for a soft bailout engineered by Treasury Secretary Timothy Geithner and White House economic adviser Lawrence Summers. Whereas Franklin Roosevelt attacked the “economic royalists” and built and mobilized his political base, Obama entered office with an already organized base and largely ignored it.